To boldly go where every photographer and artist absolutely needs to go…. So, with apologies to Kirk, Spock, Bones, Gene, Majel, and the rest of the 23rd century, whether you’re matting, mounting, and presenting a single print or photograph (see image above), or an entire portfolio of your artwork (see image below)—be it photographs / prints / drawings / watercolors / or anything else—utilizing the finest archival materials and practices is ESSENTIAL for both long-term preservation and to showcase your work in the best possible light. To do all this, our 4-part series on Your Professional Portfolio will go over all you need to know to archivally mat, mount, and present EVERYTHING in your art or photographic portfolio. In order to lend a degree of continuity to this blog on Matting I’m going to focus, as mentioned, on an old press photo of the USS Enterprise from Star Trek TOS (the original series), c.1967, which has been in my collection for a number of years (I’ll use different images elsewhere in the series to break things up a bit). 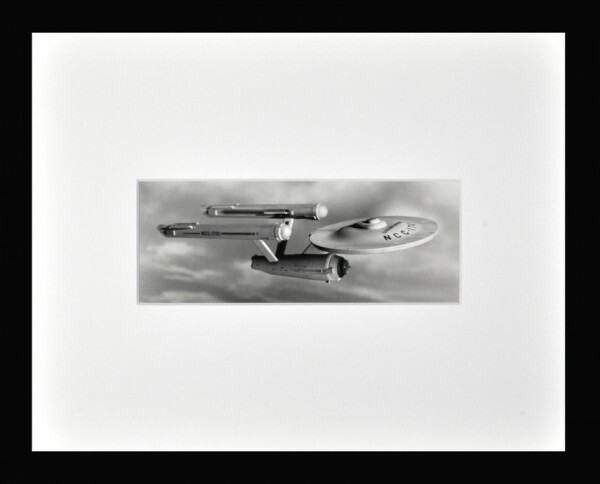 So, in this first blog, while not exactly matching everyone’s aesthetic or subject matter, working with this single photograph of the Enterprise can serve to illustrate EVERYTHING you need to know about matting YOUR OWN professional portfolio. 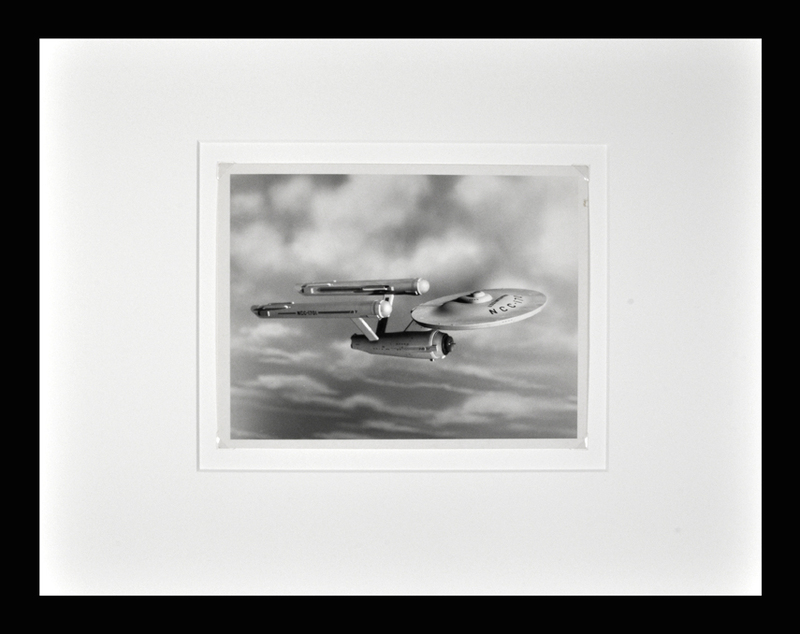 I picked up this 7 x 9-inch silver gelatin press photograph (c.1967) of the Enterprise a few years ago while trolling eBay. I grew up watching Star Trek when it first came out between 1966-1968 (I’m 57), and then again in syndication (I’ve said it before and I’ll say it again: City on the Edge of Forever – BEST. EPISODE. EVER.). Anyway, while I’m using this particular image to illustrate and explain the steps involved in archival, professional-quality matting, all the tricks and tips I apply to THIS image can be applied to anything YOU’RE matting from YOUR photograph or art portfolios. With that, we’re off on our five year mission to explore strange new … er … OK, sorry about that … we’re off to mat stuff (as long as the dilithium crystals hold out). A pristine, accurately cut mat will enhance ANY work. Here this acid-free mat performs three important functions: it elegantly ENHANCES the piece; it archivally PROTECTS it; and it essentially “DISAPPEARS,” as all the viewer’s attention is drawn to the photograph itself. In this instance the photograph itself “disappears,” as most of the viewer’s attention focuses on the ripped-up corner in the top left, the smudged right-hand border, the overcut on the bottom right, the doinks to the beveled mat edge here and there, and of course the big, fat, greasy thumbprint on the bottom left (battle damage from a Romulan Bird of Prey?). Even though this damage was exaggerated a bit for the photograph, even significantly less damage is often EXCEEDINGLY distracting, again making the artwork or photograph “disappear” as one focuses instead on the crappy mat job. As a gallery director for 7 years and a practicing artist for 35, you can absolutely trust me on that one, folks. See what I mean? In the top image the PHOTOGRAPH is the center of attention, while the thumbprint, doinked up mat bevels (“doinked” is a sophisticated art gallery term, take my word for it folks), and overcut or torn corners are the primary focal points in the image on the bottom. The purpose of any good matting and mounting job is to ENHANCE the image or artwork—not detract from it—to the point where the matting and mounting essentially “disappear.” Now, armed with that info, one more observation before we get started. With Mat in Hand, YOU can do EVERYTHING Else! 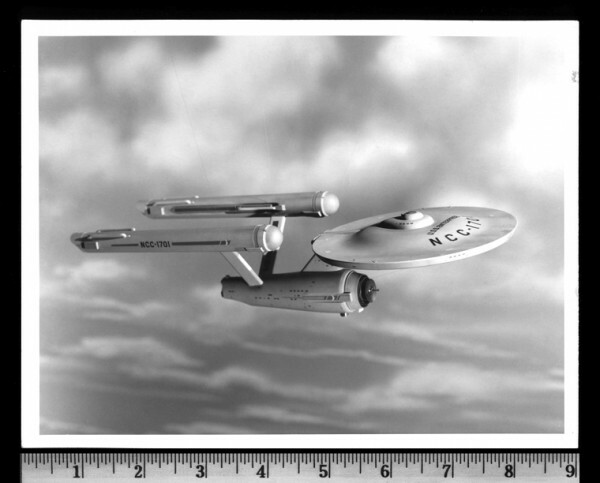 This is a screenshot of the online Custom Mat Cutting form on the Archival Methods website that was used to mat the image of the Enterprise (see photos below). This form makes life extraordinarily simple, as it does all the math for you! It is broken down into 6 steps listed on the left (in light blue), and working through each of them is explained in detail below. It really could’t be easier, just “measure twice, cut once” (and we’ll even do the cutting for you – see photos below). Still have a question? Contact us and we’ll help you out by walking you through it. 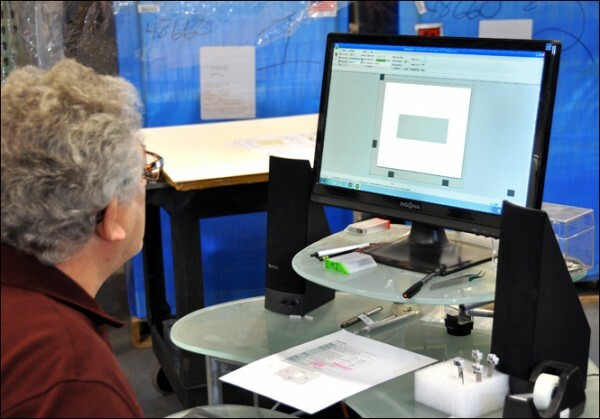 Taking the online Custom Mat Cutting specs shown in the screenshot above and entering them into Archival Methods’ high-end computerized mat cutting machine. The results–seconds later–are the perfectly cut, clean, undamaged, not bled upon(!) window mats used to mat the photo of the Enterprise as illustrated in this blog. It couldn’t be easier, and the expense of frame shops and the hassle of learning to cut good mats yourself NEVER EVEN ENTERS INTO THE EQUATION. While there are some “standard practices” regarding mat board color choice (i.e. 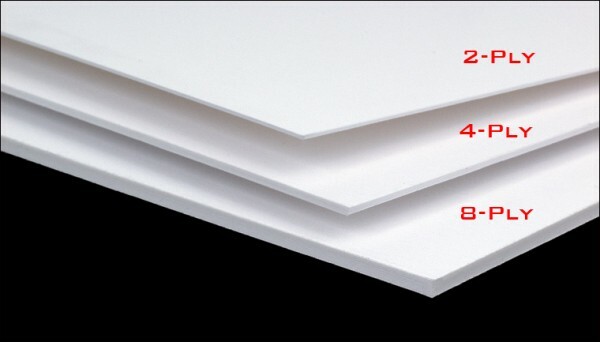 use a slightly “warmer” or natural white-colored mat board for color or sepia-toned work / use a bright white mat board for black & white artworks or photographs, etc. ), personal preference really does come into play based on the image itself / your tastes / the decor of the room in which you’re planning on hanging a framed piece. So, with a Mat Board Sample Kit in hand, place each sample color next to the piece you wish to mat and decided which color enhances the work the best / matches your tastes. Next, select the “thickness” of the mat board you like. While a 4-ply window mat hinged to a 4-ply backing board is often considered “standard practice,” your piece might warrant an 8-ply window mat for an extra sense of “presence,” or if you’re matting a rather large piece (20 x 24″ and up). 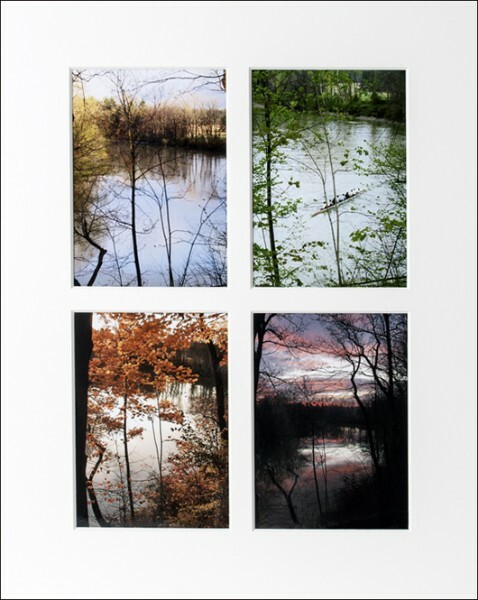 By the same token, some people prefer to use a 2-ply backing board (NEVER use a 2-ply front window mat when framing, as 2-ply board will not provide enough space between the artwork and the glass or plexi glazing). It really is your choice, but when in doubt go with the standard 4-ply window mat hinged to a 4-ply backing of the same type of mat board. This is ESPECIALLY important if you’re matting your artwork or portfolio for presentation to a gallery / for a job interview / or to a college or grad school admissions department, as consistency will make a difference in all of those instances, and EVERYONE will expect it. Once you’ve decided on what color and thickness you want to use for your archival mat, it’s time to measure your piece. To make this step as simple as possible, use the easy-to-navigate Custom Mat Cutting template (see screenshot above), which allows you to “fine tune” your measurements in all sorts of increments. My suggestion? Print a copy of this form and have it next to you as you’re working out your sizes, then transfer the measurements onto the actual online form when you’re ready to order your mat(s). 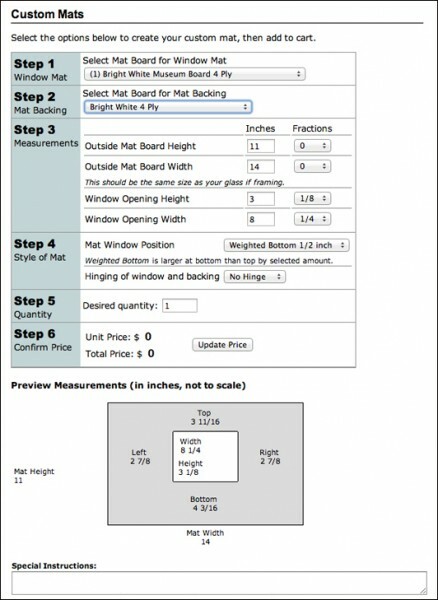 Outside Measurements: Determine the length and width of the mat’s exterior dimensions. These measurements should be based on the size of the frame and glass you want for your piece, or the size of the archival portfolio box or acid-free storage box you wish to use if you’re not framing it. This is a personal choice, as you may just want a standard 2″- 3″ inches of mat board around your piece, or you may want a much larger (or smaller, for that matter) amount of mat board surrounding the work. 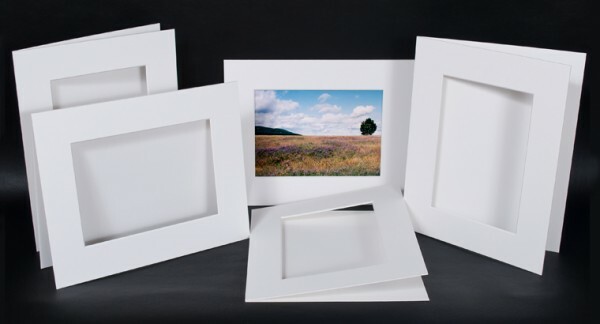 To save time and money, consider using one of the “standard” mat and frame sizes listed below as a starting point, as these are literally “off-the-shelf” standard sizes and many archival boxes are sized to accommodate these same measurements. Quick Hack: You can place a number of sheets of regular 8.5 x 11-inch printer paper on your dining room table in the size configurations listed above (or any size you actually want) and then place the piece you wish to mat on top of them, moving the paper around until you start to get a sense of what looks good to you in terms of sizes and proportions. You can mat an image any way you want, showing as much or as little of the actual piece as you see fit. In this instance a good deal of the print was purposely cropped out by the mat, but many other options are possible. Inside (Window) Measurements: Once you have chosen the overall outside dimensions of the mat and/or finished frame you want for your piece, you need to determine how much of the actual image you want to have showing in your mat’s window. Measure the length and width of the image you would like to see through the mat’s window. 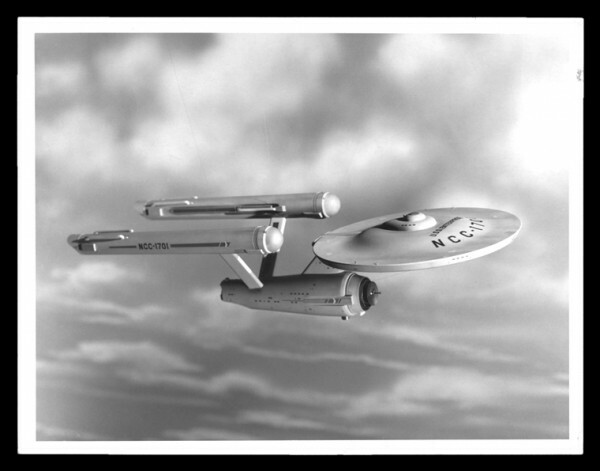 In some cases you may want to crop the image significantly, as was done with the image of the Enterprise (see photos above), while in other cases the more of the image you can see, the better. As an example of this strategy, imagine that you have an image area that measures exactly 8 x 10-inches. If a window mat were cut to this exact measurement it would be very hard to line up the mat’s window with the piece itself as the tolerance is so tight. By “coming in” (adding) 1/8th-inch on all four sides, the mat’s window measurement would now be 7-3/4-inch x 9-3/4-inch (a slightly smaller window than the piece’s exact measurements), which would still allow most of the piece to be seen while making it much easier to place the work behind the window when the time comes to mount it to the mat’s backing board. To Summarize: You may wish to crop in a great deal, as was done with the photograph of the Enterprise on the left (above). Alternatively, as described above, you may want to show more of your image, so measure the exact size of your piece and then “come in a bit” by adding an additional 1/16-inch to 1/8-inch on all four sides of your exact measurement. In addition to these two options, you can also show the entire piece by “floating” it in a mat window that is larger than the piece itself, as is seen in the photo on the right (above). In this case the Enterprise photo was measured and then 1/2-inch of additional space (on all 4 sides) was added to these measurements when determining the interior mat window size. 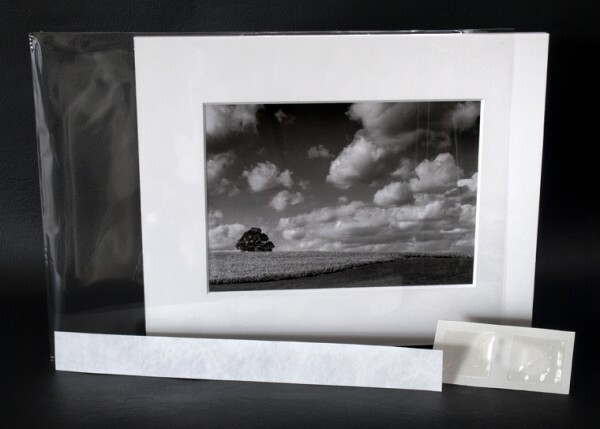 The mat was cut to these larger specs, hinged (see below), and the photograph was then mounted to the mat’s backing board using clear mounting corners (more on all that in our Mounting Your Artwork blog). 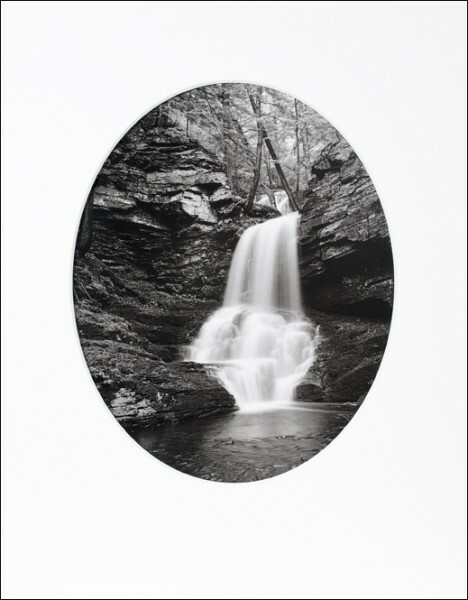 The result is that the photograph “floats” on the backing board with a window mat surrounding it in a way that allows one to see the ENTIRE piece. This option works well when you’re matting a piece that has no border at all, or when you really want to be able to see the entire artwork / photo / artifact. A “centered” mat window on the left / a “weighted” mat window on the right. While the top and bottom borders of the “centered” mat on the left are absolutely identical (resulting in the image being “centered”), the image might look a bit “low” to some people (while not to others), especially when framed and hanging on a wall. This is an optical illusion, and can be corrected if one choses to “weight” the bottom border of the mat as illustrated in the photo on the right. 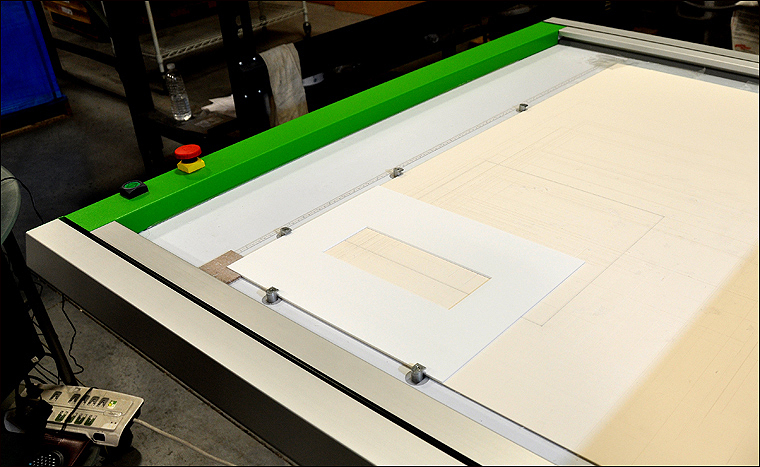 This option to “weight” the bottom of the mat is included as part of Step 4 of the Custom Mat Cutting template. Centering and Weighting: You may think that every window cut into every mat should be in the exact dead-center of the mat. While this may make “logical” sense (apologies to Mr. Spock), it often doesn’t make “visual” sense. When an image is “centered” in the exact middle of the mat, sometimes the image looks “low,” as if there is less of a mat border on the bottom than there is on the top. This is an optical illusion, but it can be visually distracting – especially when the artwork or photograph is framed and hanging on a wall. 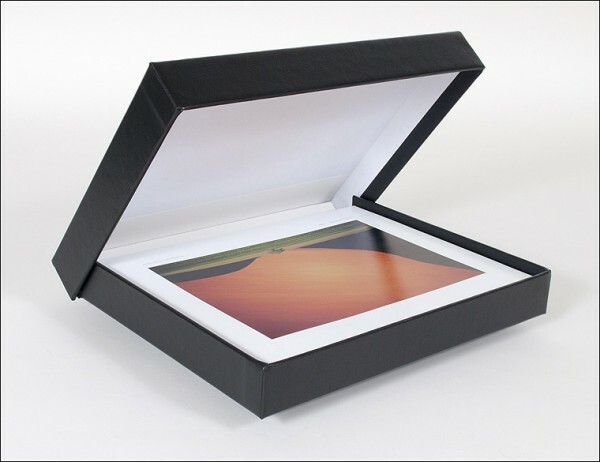 “Centered” mats are often popular as they can be used for both vertical and horizontal orientation of various artworks, especially when image size and mat size are “standardized” as is often the case with images created for portfolio presentations (vs. those to be framed and hung on a wall). As with anything else, the choice to “center” or “weight” your mat is a personal preference. You can elect in Step 4 of the Custom Mat Cutting template to “center” your mat window, or to “weight” it in increments of 1/4″ or 1/2″ or 1″ depending on the overall outside measurements of your mat. In “standard practice,” a smaller mat (8 x 10″ / 11 x 14″) might only need 1/4″ of extra weight at the bottom, while medium sized mats (14 x 18″ / 16 x 20″) might benefit more from 1/2″ of additional weight at the bottom, and large mats (20 x 24″ and up) should probably have between 1/2″ and 1″ of extra weight. While all of this is dependent upon the specific size of the artwork you are matting and the size of the mat you would like to use, when in doubt go with the “standard practices” mentioned above. It’s Actually Quite Easy: Now, I’ve just gone into a lot of detail about numbers and fractions and relative positions, but what’s great about the Custom Mat Cutting template is that it calculates all the math for you, which then allows us to easily cut a perfect mat for you! All you have to do is enter the correct measurements for the exterior size of the mat you want and the size of the window you want. Boom! Done! If you still have questions or need clarifications, we hope you will feel free to contact us to sort out all the options available to you or to discuss your particular needs. 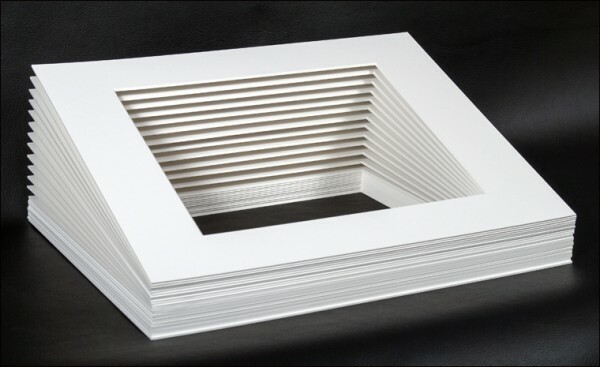 The last thing you need to do now is decide on which interior side you would like your window mat to be hinged (i.e. attached) to the backing mat board. 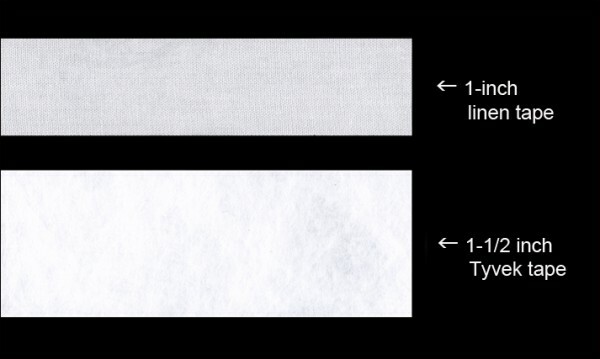 Hinging is usually done with either water-activated acid-free linen tape or self-adhesive Tyvek tape (see photo above). 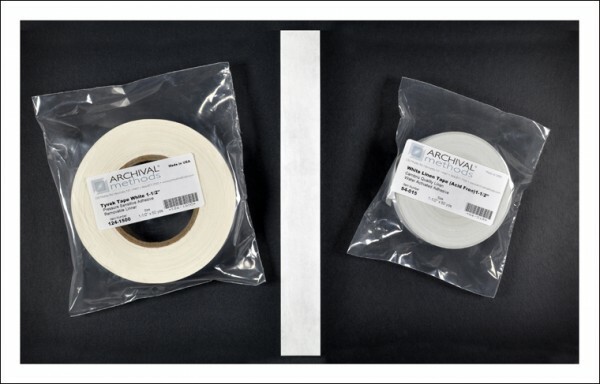 Both of these tapes come in rolls, in 1-inch and 1-1/2 inch widths. While which one to use is a personal preference, yours truly ALWAYS uses 1-1/2 inch wide tape, as I believe it adds a bit of structural strength to the hinge. 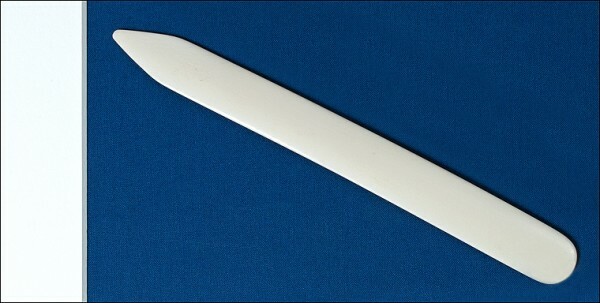 Both tapes are easy to cut to size, apply by hand, and burnish down with a simple but very effective burnishing bone. Yup, you guess it—it’s a personal choice, but once again there are some “standard practices.” Some individuals will ALWAYS hinge along one of the long sides, as in theory a long side hinge will lend greater structural support. Others (including yours truly) will ALWAYS hinge across the top of the mat—for both vertical and horizontal mats—because it just “makes sense,” at least to me. When in doubt, hinge across the top unless, of course, you just don’t want to. When hinging your own mats, ALWAYS make sure that you have the top window mat oriented correctly (see the helpful Quick Hinging Hack below). Straddle the center seam between the top and bottom boards so that the tape is dead-center on this seam, as in the photo above. If you choose to hinge your own mats, please refer to the photo above. 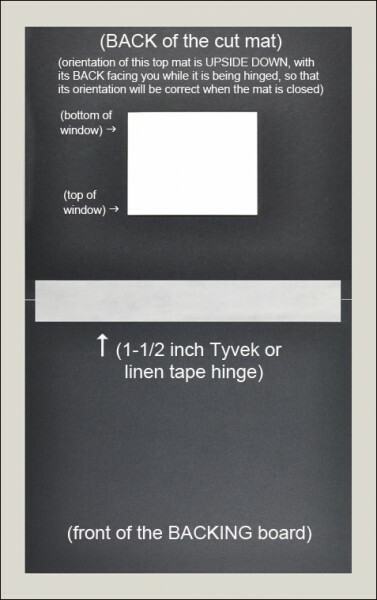 In it I have used a black window mat (the top board in the photo below) and a matching black backing board (the bottom board in the same photo) as it makes the tape hinge in the center more visible then would be the case had I used a white tape on white mat boards. If you are hinging your mat yourself, cut the tape you are using (Tyvek self-adhesive or water-activated linen tape) to your desired length, usually within a half inch of each side of the mat board (see photo above), and line up the center of the length of tape with the seam between the top window mat and the bottom backing board. Place the tape so that it straddles the center of this seam, and then use a burnishing bone to securely burnish down either type of tape once it is placed. Final Quick Hinging Hack (if doing it yourself, and remember that we’ll do it for ya if ya want): OK, so you’ve got your window mat perfectly measured and perfectly cut, and now its time to hinge it. MAKE SURE you are hinging the CORRECT side and the CORRECT orientation! In other words, DO NOT hinge the “front” (the beveled side) of your window mat to the backing board, rather make sure you are hinging the “back” of the window mat (the non-beveled side) to the backing board. Also, if your window mat is “weighted” take a moment and measure the top and bottom borders to MAKE SURE that your “top” and “bottom” are oriented correctly and that you’re hinging the TOP and not the BOTTOM of your window mat to your backing board—check twice, hinge once. I’ve been matting artwork and photographs for over 35 years, folks, and I STILL mess this part up on occasion. Do yourself a favor and check THREE times! In addition to standard “single rectangular mats with singular rectangular windows,” Archival Methods also offers the ability to cut multi-windows in a single mat / custom oval or round mats / pre-cut bulk mats / archival mat and presentation kits / pre-cut exhibition mats, and a host of other matting-related products and services. We hope you will contact us to discuss archival solutions to all your matting and presentation needs. So, with your finished mat in hand and all ready to go, congratulations are in order. That was actually easy. Now its time to learn all the tricks (and “standard practices,” of course) of mounting! 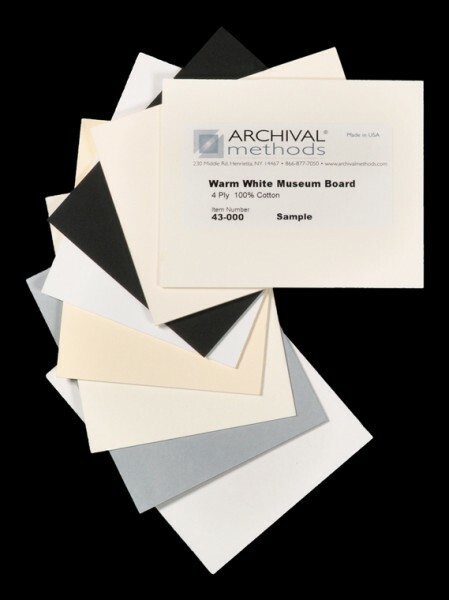 As mentioned throughout this blog, if you have additional questions on matting, or you would like more information on any of our museum-quality archival storage and presentation materials, please contact us here at Archival Methods. We’re always there to help with any archiving, storage, or presentation questions you may have.